Rupert Murdoch’s News Corp has reported a loss of US$643 million ($816.8 million) for the last financial year primarily due to write-downs in its Aussie and UK newspaper businesses, as well as Foxtel. The full-year loss was in stark contrast to the company’s US$235 million profit for FY16, and was driven by pre-tax non-cash impairment charges of approximately US$785 million, primarily related to the write-down of fixed assets for its UK and Aussie newspapers, which include The Daily Telegraph, The Australian and The Herald-Sun. The decline was also due to “lower equity earnings of affiliates”, primarily from a US$227 million write-down of News Corp’s 50 per cent investment in Foxtel. Overall revenues fell 2 per cent to US$8.14 billion in FY17, which the company said was partly due to lower print advertising revenues for its News and Information Services division. Fiscal 2017 revenues for this division fell 5 per cent to $269 million, with ad revenues declining by US$202 million. News Corp’s digital real estate division, which includes REA Group and Move, made up almost 40 per cent of the company’s profit in the last financial year, and CEO Robert Thomson said he expects this figure to increase in the coming years. 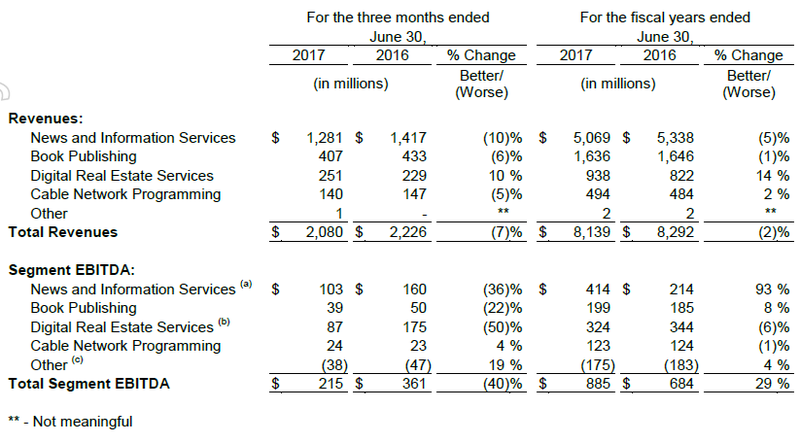 Meanwhile, Foxtel saw its profit fall to $US59 million from $US180 million in FY16, which was mainly due to a $US58 million loss from a write-down in its investment in Network Ten, and $US53 million in losses from its shutdown of Presto. “Fiscal 2017 was a significant year for News Corp, as we saw tangible improvement in profitability powered by the fast-growing digital real estate services segment, and we charged a premium for premium content while focusing on operating efficiencies,” Thomson said. “FOX SPORTS Australia and reinforced its leadership in Australia with the successful launch of the Fox League channel and by extending its domestic soccer rights for another six years.